Once a popular style, this antique leafy script is not often seen today. 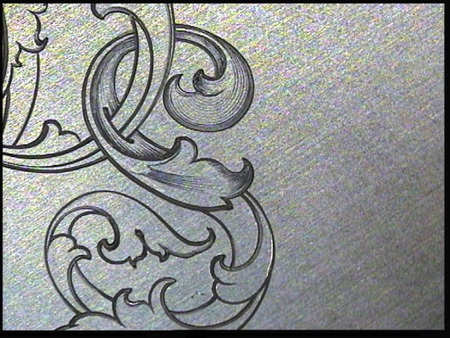 A hundred years ago, engravers were very proficient in a variety of lettering and monogram styles, and there are many exquisite examples which show their mastery of design and execution. 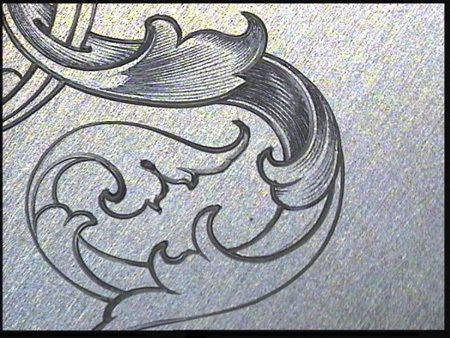 This is an example of leafy script lettering showing the progression of cuts from outline to shading. I apologize for the low resolution photos, but they were shot at my workbench with a point-and-shoot digital camera while teaching a class overseas. While this is not a how-to tutorial, it is hoped that the student can pick up a few ideas in layout and shading by studying the sequence of photographs. Finely shaded work on high-wear pieces of jewelry (rings, etc) is risky business, as the delicate lines are easily damaged. The customer should be aware of this before accepting the job. For pendants and other articles that receive little or no wear, styles such as this are excellent choices and produce rich, beautiful finished pieces. 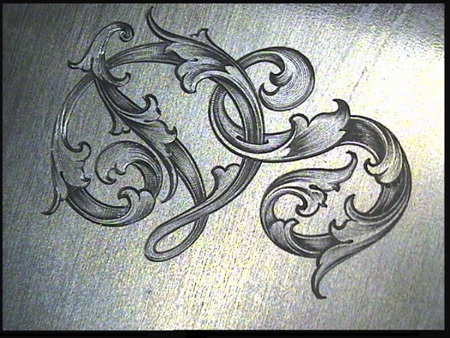 The initials were drawn onto the workpiece with pencil and transfer wax, and outlined with a 120° graver. 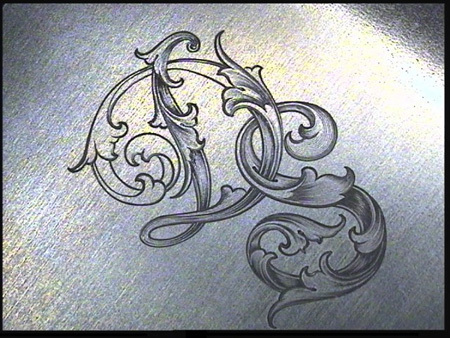 Using the same 120° graver, each element of the letter is delicately shaded. Darker areas behind overlapping leaves add to the illusion of 3D. 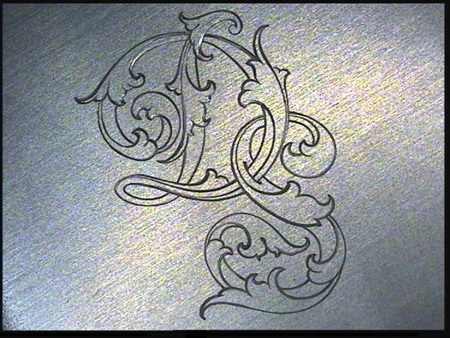 Unshaded areas appear flat and lifeless as the monogram nears completion. Crosshatching completes the job and a classic style is recreated. Check out the tutorial on Drawing Leaf Script. 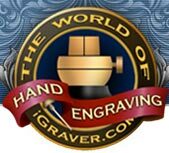 All work done with a 120° graver and GRS GraverMach with Monarch handpiece. Antwerp, Belgium 2005.